WINNER of Le Creuset Giveaway! 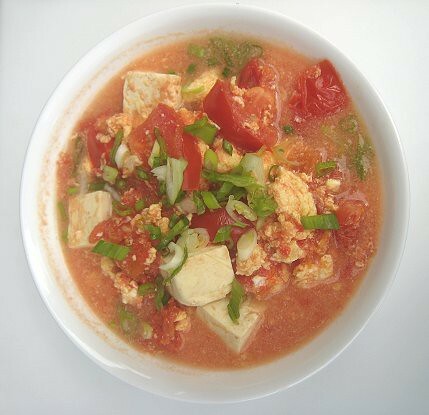 As we've noted before, it's only recently that we've fallen in love with stir-fried tomato and eggs, Chinese-style. 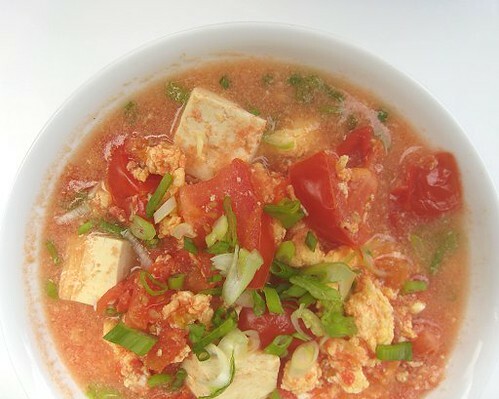 In this TOFU edition of Weekend Wokking, we reclaim our Chinese heritage with Mr. Zheng's Soupy Tomatoes and Eggs with Tofu 蕃茄雞蛋跟豆腐. We're not actually related to Mr. Zheng: I saw this dish on EatingAsia and have been fantasizing about it ever since. Of course, I have also been fantasizing quite fervently about wandering down those food alleys that we didn't find or even know about when we went to Taiwan. Do read the EatingAsia post as it is quite amusing. Doesn't the conversation sound familiar? Seems like it was only yesterday that TS -- albeit vicariously through AL -- had the same conversation. The conversation along the lines of "I already told you. 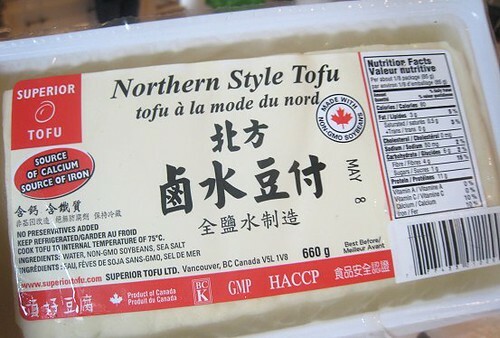 . ."
JS picked up a couple of tubs of this "Northern Style Tofu" at our usual supermarket. 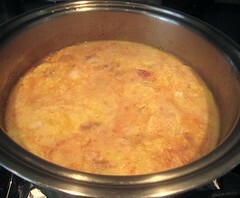 Upon smelling/tasting it, it had more of a "soy milk" aroma and flavor than the usual tofu we buy. It was also a bit rougher in texture. 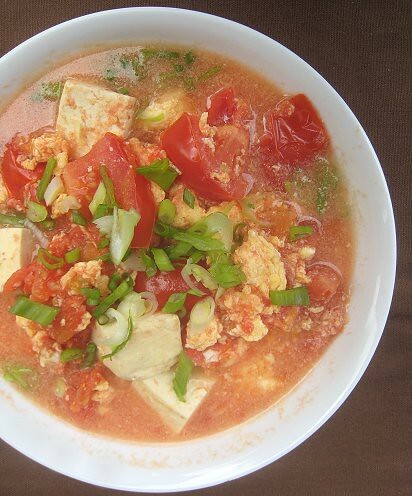 Does anybody know exactly what differentiates this Northern-style tofu from others? And in what applications it is used? I thought it would work quite well in this dish. Look at the bottom of the pile. 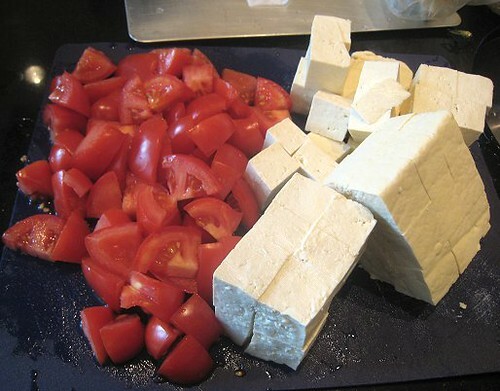 There they are, the two blocks of tofu. Just some of the chopped tomatoes we used. As home-style dishes should be, this one was quite easy and fuss-free. Let's begin! 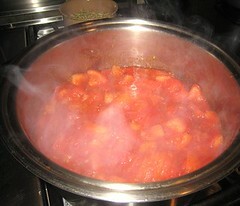 To begin, I dumped the majority of my chopped tomatoes into a pot over medium heat. 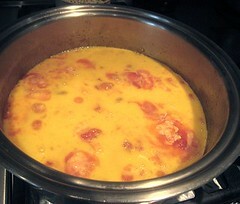 I waited until they were "soupy", then carefully poured in beaten eggs to form a layer on top. I turned the heat to low and covered the pot. 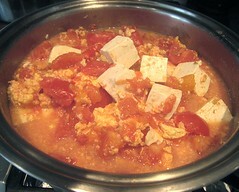 When the egg had cooked, I added the chopped tofu and the rest of the chopped tomatoes. I carefully mixed everything together. All the seasoning that this needs is salt and sugar. Well, I didn't seem to stir carefully enough, as the eggs broke up more than I would've liked. But, that is the beauty of this dish: it doesn't really matter. Do what you desire. Want it saltier? Add more salt. Want it sweeter? Add more sugar. I would add more eggs next time, I think. What we ended up might be something that's between a soup and a stew but still all of delicious. Serve with white rice, add even more scallions (I love scallions) and dig in. You don't have to be a "real" Chinese to enjoy this dish: even us "fake" ones love it just fine. The dish really is simple to make. 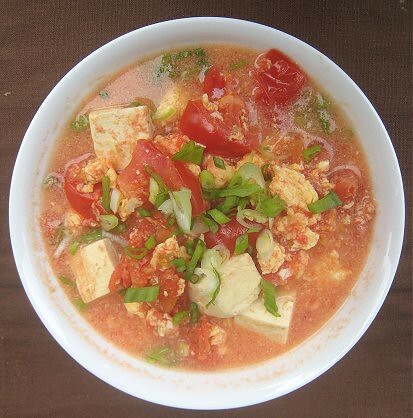 If you would like a recipe, do visit EatingAsia and read all about Mr. Zheng's dish. The host this month is Sweatha of Tasty Curry Leaf. Soup, stew, who cares what you call it so long as it's delicious! 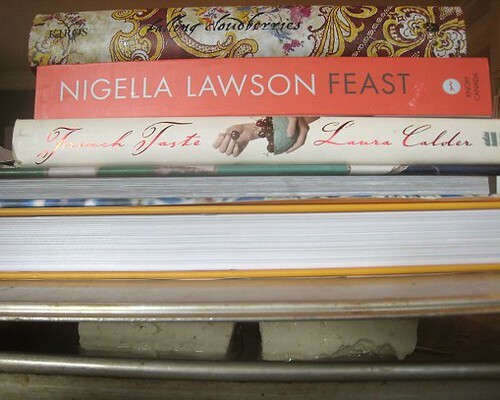 And I like what you did with those cookbooks...I guess that's what I should do with the ones I'll probably never use! 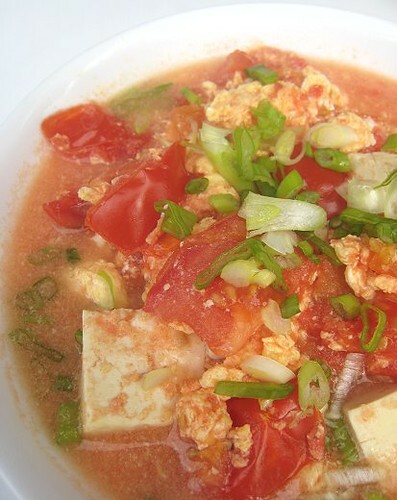 Yep, Chinese-style tomato with eggs is such a comfort to eat at home. This is the first time I see this dish; I admire you for going through all this research to get it right; it looks yummy, I must say! Yummy. I like the natural sweetness that comes from the tomatoes. I'm curious about Northern tofu too. Hmm. This dish looks delicious. Simple and easy to make too. I'll have to try it soon:) yum! The Northern-style tofu is more pock-marked, and plain, really smelled and tasted more soy milk-ish. Love shakshuka! Oh, we would have to look into Mirza Ghassemi. Know what, maybe we *are* "fake" Chinese. NO ONE in our family wanted to eat this! Only JS and I ate this. Weird. Very weird. I wouldn't usually go for a tomato stew dish like this but there's something about that's really drawing me in! Definitely saving the recipe.